Ultra Durable 3 technology includes a 2oz copper design for a lower working temperature and a reduction of hotspots, better overclocking, better power efficiency allowing electric current to flow with less resistance and enabling more power efficient circuits with lower power loss and less heat generated. You'll find the majority of GIGABYTE motherboards sporting at least the 'Classic' version, where higher-end models like this will up the ante even more by including Japanese solid capacitors, lower RDS(ON) MOSFET's and Ferrite Core Chokes. 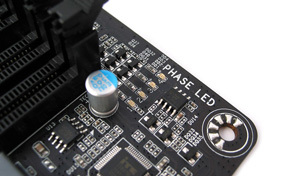 8 + 2 Phase Power delivery is present with the 8 referring to the popular Driver MOS MOSFET's (branded DrMOS by MSI), while the additional '+2' phases are an older style MOSFET. These are all hidden other the heatsinks around the socket area. 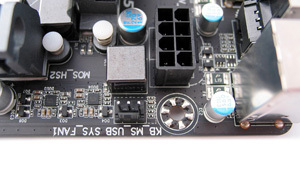 The motherboard also features Dual-Power technology, with a 'DP-switch' and multi-gear power saving that is adjustable via windows, and this technology allows CPU VRM power phases to split evenly into 2 sets of power engines that operate in tandem. This allows 1 set of power phases to rest while the other is active, as opposed to a traditional power design, where all the power phases are always active. 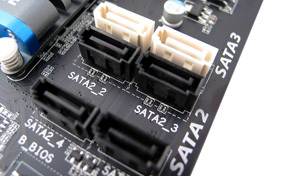 SATA 3.0 - Finally we have a native Intel solution for SATA 3.0. 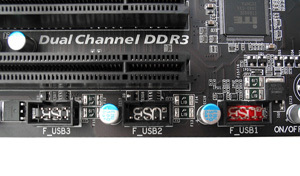 While the standard chipset features support for only two SATA 3.0 ports, it's better than nothing. The other four ports are the usual SATA 2.0, and while Intel does claim RAID 0, RAID 1, RAID 5, or RAID 10 is achievable across all six ports the performance repercussions can vary. 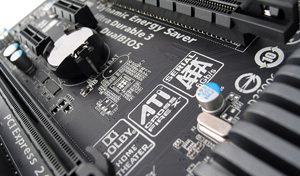 DualBIOS - This feature includes a second BIOS chip on the motherboard. 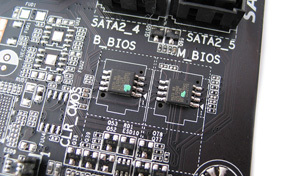 If something goes wrong during a BIOS flash the system will automatically revert to a previous version stored on the backup BIOS chip without hesitation. GIGABYTE has also been able to include 3TB+ hard drive support without the need to move to a UEFI architecture. USB 3.0 support continues to be provided by a third party NEC D720200F1 controller due to no chipset offering a native USB 3.0 solution. 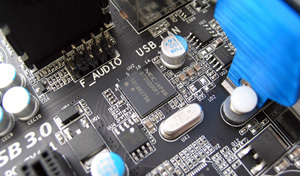 One chip allows two USB 3.0 ports to be available, which are backward compatible with USB 2.0. Power Phase LED display is an extension of GIGABYTE's Dynamic Energy Saver package that runs via Windows. 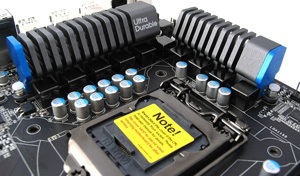 While this gives you a visual indication of the load/usage of the power circuitry, they are unable to be disabled while the Energy Saver utility is enabled, nevertheless if the LED lighting isn't for you, making sure the processors power saving features are enabled in the BIOS will aid similar benefits. CrossFireX Technology is present allowing the use of two AMD video cards for a boost in gaming performance. While two physical x16 slots at present, the second has been physically limited to a maximum of x4 sharing bandwidth from the Southbridge chipset rather that splitting the top slots x16 lanes in half, as we find in more expensive motherboards. While this isn't a problem for people using single GPU setups, for those wanting to make the most of their second card, it might be worth looking at something like a UD4 variant. 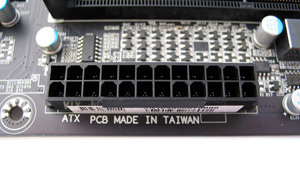 24-pin and 8-pin ATX Power connectors are located in easy to access areas out of the way of other components, removing the need to purchase extensions unless your power supply cables are short to begin with. Dynamic Energy Saver 2 utilizes a proprietary hardware and software design to reduce power consumption and deliver optimized auto-phase-switching for the CPU, Memory, Chipset, VGA, HDD, and fans when possible. The Windows software is fairly straightforward to use, and can be set to a variety of power saving levels, especially handy for PCs that are on constantly. @BIOS allows for easy BIOS flashing in Windows, while the Smart 6 centre gives you quick access to extra management tools from speeding up boot times to encrypted password storage, system monitoring, and much more. 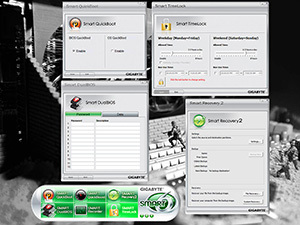 Other Gigabyte features and technologies include Q-Flash, Xpress Install, Xpress Recovery2, eXtreme Hard Drive (X.H.D), Q-Share and Cloud OC support. 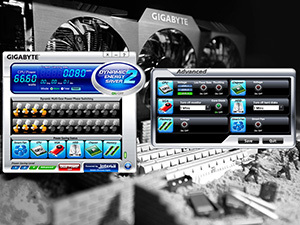 More details of these can be found on Gigabyte's website.